Take This Once-in-a-Lifetime Experience Home and Win a copy of the Blu-ray! The ultimate love story continues in Andrew Lloyd Webber’s spectacular musical Love Never Dies, a sequel to the legendary “Phantom of the Opera.” From musical theater’s most captivating composer and featuring the new highly-acclaimed Australian production filmed in Melbourne, Andrew Lloyd Webber’s Love Never Dies arrives on Blu-rayTM with perfect hi-def picture and perfect hi-def sound and DVD on May 29, 2012. 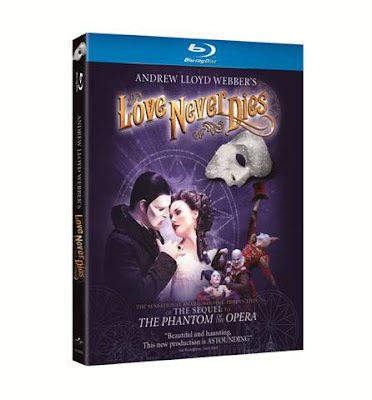 With lush visuals and a mesmerizing score that rivals the original in power and beauty, this live production of Love Never Dies is a romantic necessity for every Broadway fan’s collection. The year is 1907 and ten years have passed since the Phantom’s disappearance from the Paris Opera House. He has escaped to a new life in New York where he lives amongst the screaming joy rides and freak-shows of Coney Island. In this new electrically-charged world, he has finally found a place for his music to soar. All that is missing is his love - Christine Daaé. Now one of the world’s finest sopranos, Christine is struggling in an ailing marriage to Raoul. So, it is with excitement she accepts an invitation to travel to New York and perform at a renowned opera house. In a final bid to win back her love, the Phantom lures Christine, her husband, and their young son Gustave from Manhattan, to the glittering and glorious world of Coney Island… not knowing what is in store for them. We watched this last week and I have to say it was great. It made me wish I would have gone to see this live while it was out, but I must say the quality on this Blu-ray is phenomenal. I love musicals, I loved Phantom of The Opera, so getting a chance to see another part of the story was amazing. Not only did myself and my husband enjoy watching this movie, but so did my six year old daughter. She's very into music, art, etc. and she was glued to the TV. The story was well told in this and I'm sure anyone with the love of musicals will enjoy this and here is your chance to win your very own copy. Disclosure: All opinions are my own. I received Love Never Dies at no cost for the purpose of this review. No other compensation was received. A big thank you to the PR company for providing the giveaway prize! Where does the Phantom now reside?